I cooked a batch of chickpeas and used the leftover aqua faba to make these pavlovas. I did, however, reduce the cooking liquid until it had thickened slightly, then allowed it to cool to room temperature before using it in this recipe. Ingredients in aqua faba recipes are always measured volumetrically. Your results may differ if you weigh your ingredients. You will need a free-standing mixer to make these pavlovas. That, or very strong forearms and lots of patience. Whipped coconut cream and fresh fruit to serve. Pre-heat the oven to 120C (100C fan forced). With a sharpie or similar, draw twelve 10cm circles on the baking paper. I used a large jar lid for this. Allow room between the circles as the pavlovas expand slightly in the heat. Flip the baking paper over so the pavlovas do not come into contact with the ink. Add the aqua faba and cream of tartar to the scrupulously clean bowl of a free-standing mixer. The bowl needs to be very clean or the aqua faba will deflate, just like a normal meringue. Whip for 3 - 5 minutes on high speed, or until stiff peaks have started to form. The meringue needs to be stiff enough that it would remain in the bowl if the bowl were to be tipped upside down. With the motor running, on medium - high speed, gradually add the sugar a Tablespoon at a time. Allow the sugar to dissolve between each addition. Once all the sugar has been added, scrape down the sides of the bowl. Continue to whip for a further two minutes, or until the meringue is stiff and glossy. Dollop spoonfuls of the meringue onto the baking paper, over the circles. Gently spread the meringue out to the edge of the circles. I used a small spatula for this. As you are spreading the meringue, try to create a small depression in the centre. This creates a little well to later hold the cream and fruit. Bake the meringues for two hours. Do not be tempted to open the oven during this time. After the cooking time is up, turn off the oven and leave the door shut. Allow the meringues to cool to room temperature I allow mine to sit in the oven overnight. Use as desired or store in an airtight container for up to three days. When ready to serve, decorate the pavlovas with coconut cream and fruit. * Golden caster sugar is an unrefined caster sugar. It is widely available in supermarkets in Australia. 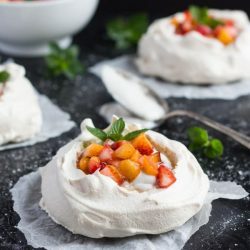 Golden caster sugar will give the pavlovas a creamy, off-white colour. If you want pure white pavlovas, or cannot locate golden caster sugar, use normal caster sugar instead. I am not proficient at piping so have made these pavlovas freehand. If you have excellent control of a piping bag you may like to use that instead.